Moments ago, undefeated pound-for-pound champion Floyd Mayweather was expected to turn himself in to a Las Vegas court to begin serving his 90-day sentence. 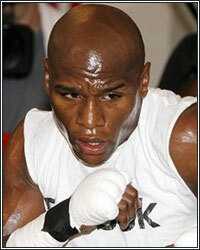 However, sighting an agreement with the District Attorney, Mayweather's attorney requested a continuance of his surrender to June 1, 2012, so he could honor his May 5 fight commitment with the MGM Grand. Noting that a Mayweather fight on Cinco de Mayo would be worth more than $100 million to the community of Las Vegas, Mayweather's attorney pointed out that prior to the plea bargain, commitments were made based solely on the approval of the District Attorney. "Mr. Mayweather and his managers and trainers came to me and asked me if they could commit to a Cinco de Mayo May 5, 2012 fight in Las Vegas. I discussed it with the District Attorney's office because as we envisioned the court proceedings at that time, there being no plea bargain in place and a plea bargain not looking probable at that time in early November 2011, we forecasted that there would be a combined misdemeanor trial/preliminary hearing on December 21 and December 22, because of the unique combination of a felony preliminary hearing and misdemeanor trial and Mr. Mayweather's right to testify in his own defense in his misdemeanor trial, we envisioned the misdemeanor would not be completed and would be continued until after the felonies, assuming they were bound over to district court," Mayweather's attorney explained. "As lawyers, we strategically looked at it and determined that a May 5 fight would be doable, and I confirmed this with the District Attorney, David Roger, and said specificially, 'I need your commitment that May 5, 2012, I can commit Mr. Mayweather to a fight.' And it's necessary to commit such a fight as that because major elite idol fights don't occur on the spur of the moment. On November 2nd, when I met with [Disctrict Attorney] David Roger, for cable television rights, commitments blocking out a date, they needed to know it. The MGM Grand needed to know it, and so they needed my commitment as to whether he was available. David Roger committed to me, he had just announced that he would be retiring early from the office, and he said, 'I agree with your analysis. This won't interfere and you can tell the district court judge that the former district attorney committed to the availability of Mr. Mayweather on May 5th for the fight. We were envisioning at the time a probable bind over in trying to continue a felony trial, and so, based upon that commitment, I committed to Mr. Mayweather and his managers and trainers, 'Yes, go ahead sign for the fight. You can do it.' The committed MGM Garden, they committed the block, however you reserve the pay-per-view television, and that fight, with an opponent, is scheduled and permitted as we speak. With Mr. Mayweather's training regimen, I had not envisioned we would ultimately negotiate this case and I would end, or my client, with a sentence of 90 days in Clark County jail. That does not work for training for the May 5 fight, and so I am respectively requesting a continuance of his surrender to June 1, 2012, so that he can honor this fight commitment to the MGM." Although the District Attorney argued that Mayweather should not be treated any differently than anyone else and there was no reason to delay his incarceration because the fight could be rescheduled, Mayweather's attorney explained that the business of boxing made it difficult for them to reschedule their commitment. The judge was of the opinion that the rehabilitative counciling that is set to take place after the incarceration is more important than the actual jail time, therefore she granted Mayweather's request to delay the 90-day sentence. It appears as though Mayweather will indeed be fighting on May 5. The question is, who?